If anyone else showed me their collection of Second World War incendiary bombs, I should be entirely astonished but with Gary Arber it was completely normal behaviour. Over the years, I have come to expect no less of him. 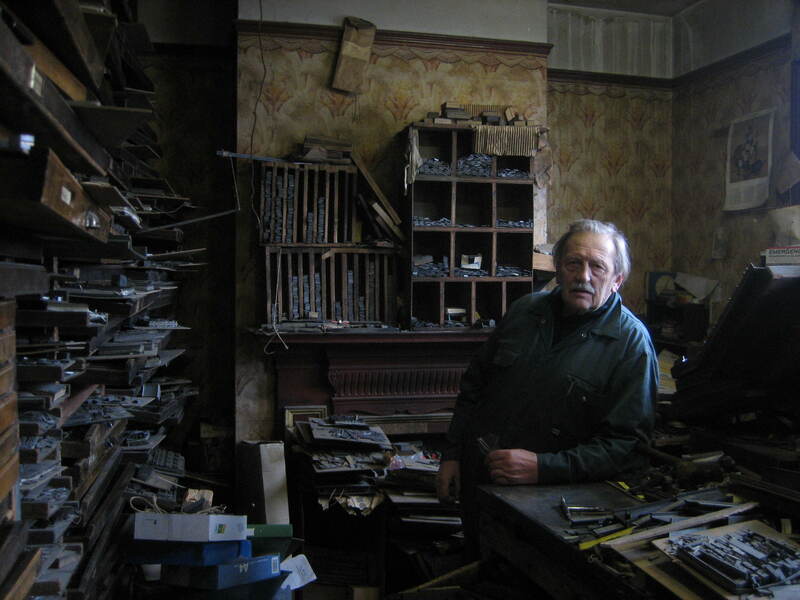 Ever since I first visited Gary’s old print shop in the Roman Rd, where he oversaw the family business established by his grandparents a century earlier, I have learnt to appreciate Gary as the custodian of wonders. Three years ago, when Gary sold up the shop, his magnificent collection of printing presses were hauled off to a new life elsewhere and W.F. Arber & Co Ltd passed into legend in the Roman Rd. 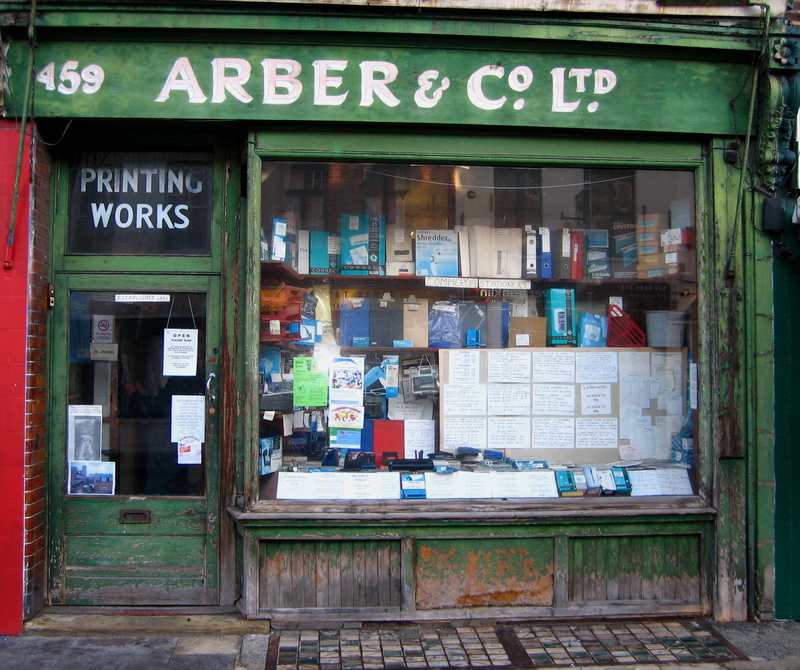 Now it has taken its place in history as the print works where Emily Arber printed Suffragette handbills for Mrs Pankhurst, but Bow is a lesser place without Gary Arber as a living connection to the old East End. Unable to contain my curiosity any longer, I realised it was my responsibility to take the train down to Romford to visit Gary and see how he is getting along these days, on behalf of everyone else who misses him in our neck of the woods. 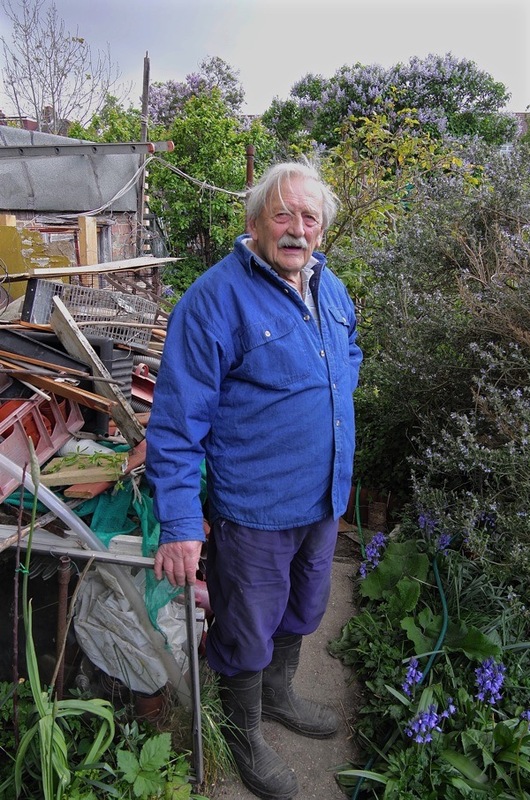 Thus it was I came to be standing in Gary’s ramshackle shed last week, gasping in awe as he showed off his collection of incendiary bombs, all now rendered entirely harmless you will be relieved to learn. 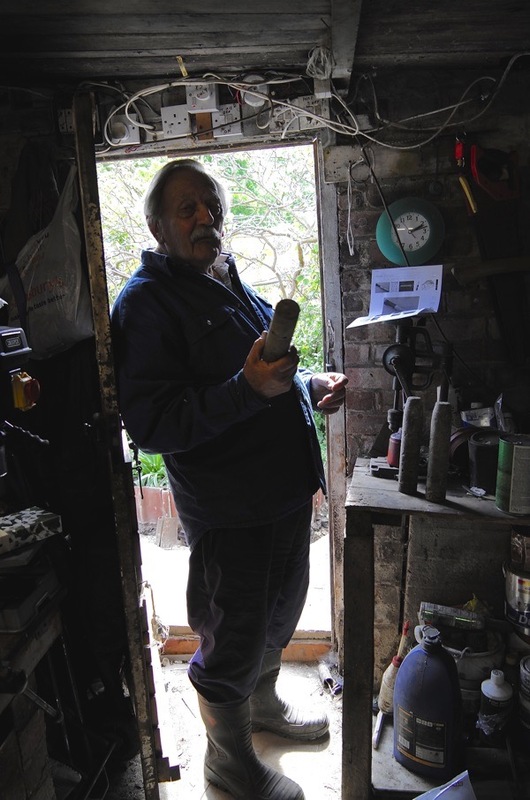 Constructed of pieces of other buildings, extended over time and filled with a large collection of old tools, Gary’s shed is a fine specimen of its kind. Yet casting an eye into the shadows, I realised that it descended to another level below ground. Gary explained to me that this subterranean construction was an Anderson Shelter where he, as a child, and Florence, his mother, slept each night during the Second World War while the bombs dropped on Romford. 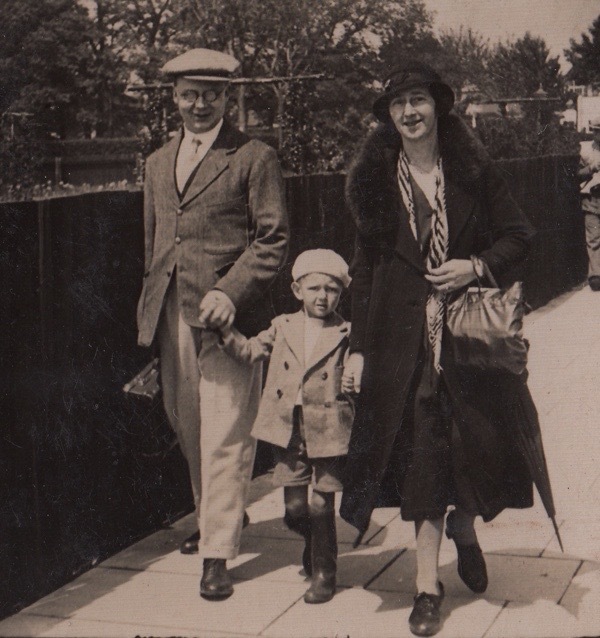 In 1929, Gary’s father brought Florence down from the East End on an excursion to show her the newly-laid foundations of the house he had bought in which they were to spend their married life and where, in 1931, Gary was born. Apart from a short spell as a pilot in the Royal Air Force, Gary has lived here his whole life and the house exists today as a time capsule more-or-less, with an oxblood and butter paint scheme, an original yellow and black bathroom and a substantial enamelled iron stove in the kitchen. I should be very surprised if there are any other of the original occupants of this long suburban street still resident except Gary. 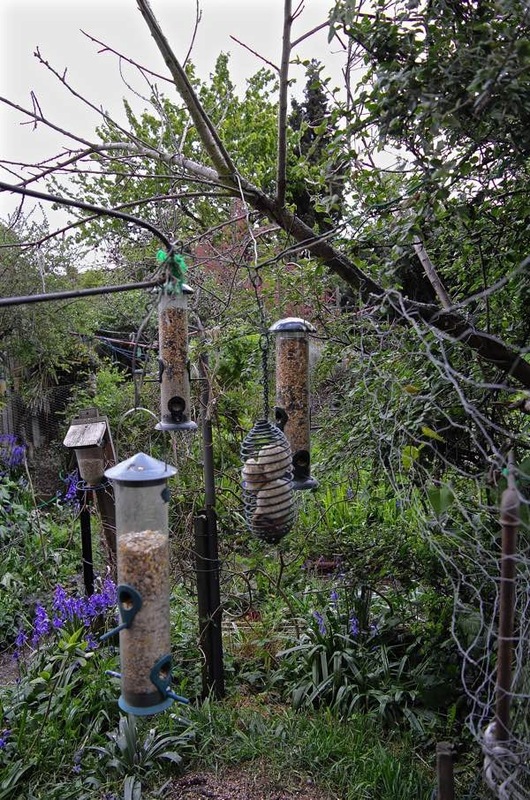 In this cosy dwelling, Gary and his wife, Ruby, pass their days watching the birds coming to visit the array of feeding devices, hung just outside the picture window in the rear parlour. 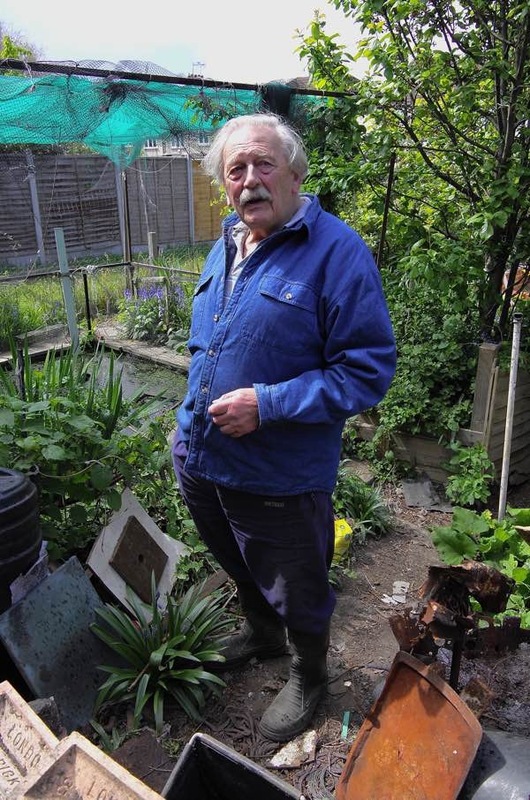 I was informed the avian population in this particular corner of Romford consume half a ton of bird food annually, and Gary is especially proud of his population of over sixty sparrows that he has nurtured in recent years by making holes in the eaves where they can nest. 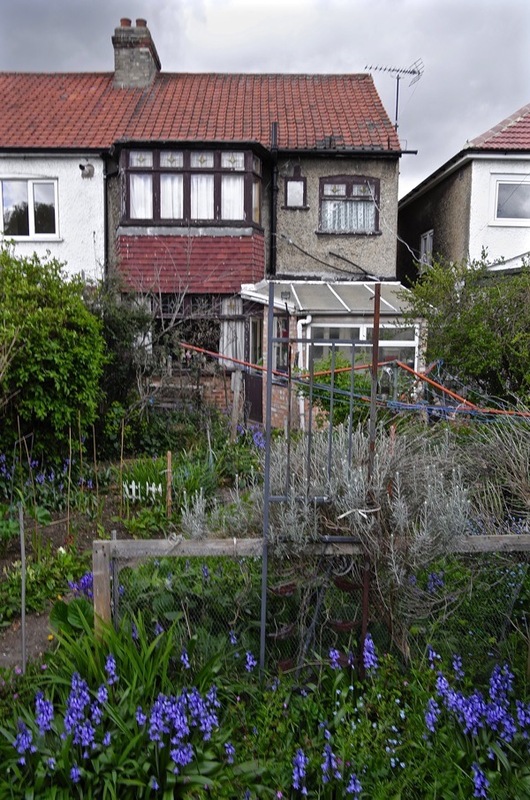 A glimpse at the photograph of the immaculately-tended garden with its flawless lawn and formal borders which formerly existed behind the printshop in Roman Rd reveals that Gary’s relaxed horticultural style is in strong contrast to his grandparents. 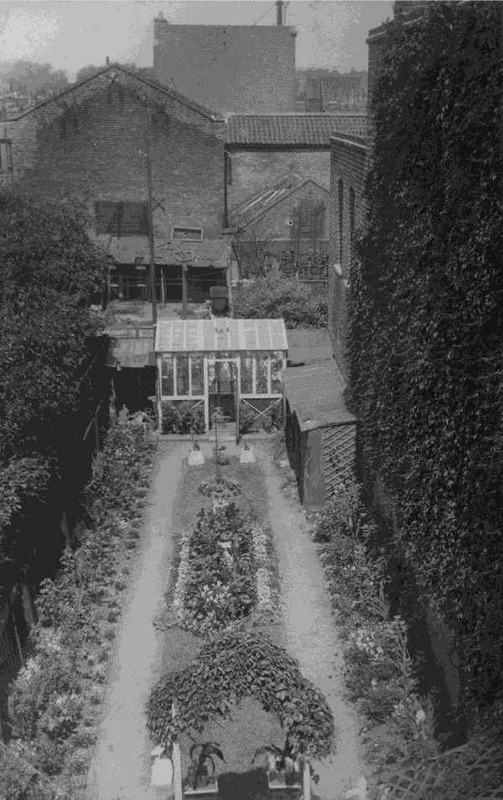 Yet, in his parents’ day, the garden in Romford was similarly prim, with a lawn permitting clock golf which was a popular pastime among the Unitarian Congregation of Bow. Even after they left the East End, Gary’s parents were able to maintain their lively social life enjoyed among members of the congregation, by luring them to Romford with this innocent sport. 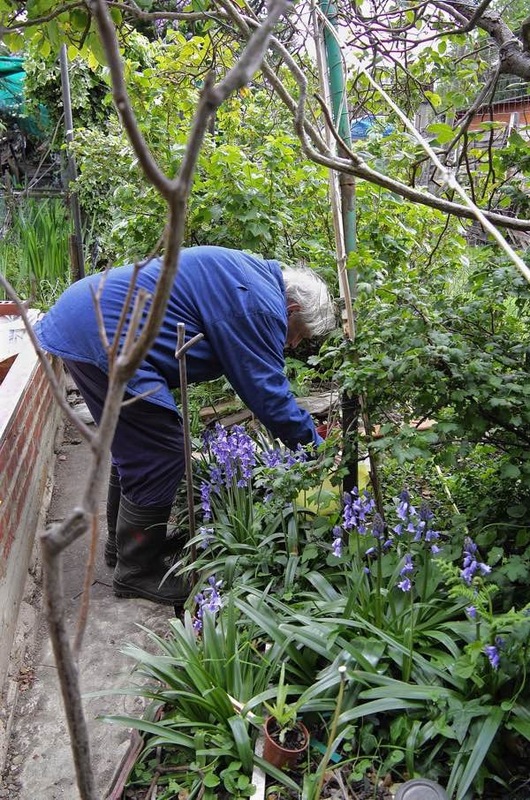 Gary is a free spirit in horticulture, scattering packets of wild flower seeds and declaring that there is no such thing as a weed in his garden. The outcome is an exuberant rush of dense growth at this time of year, with bluebells, forget-me-nots, dandelions and aquilega in plenty. 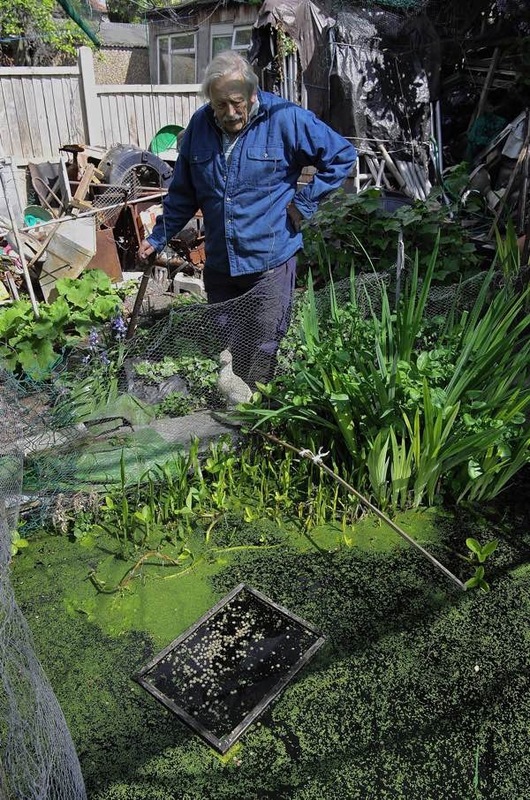 It makes an ideal environment for the urban wildlife that Gary cherishes. An upturned boat serves as home to a pair of foxes and their litter of cubs, while a series of ponds provide dwellings for a variety of aquatic life. 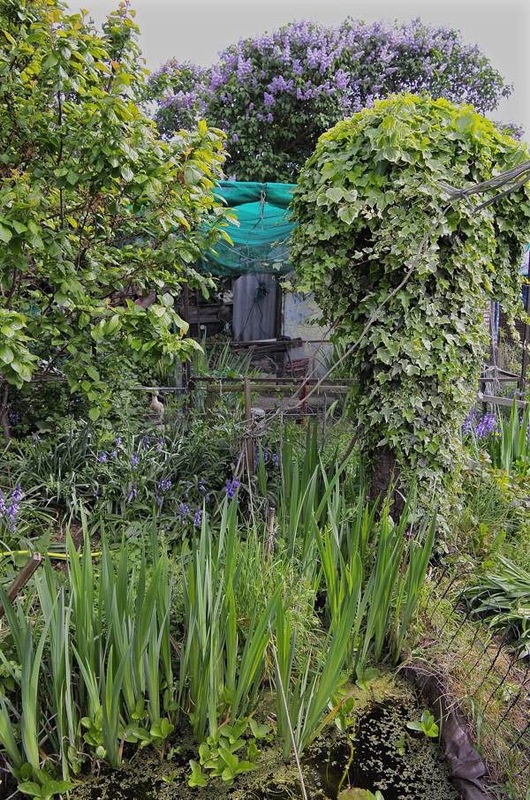 As we passed the shed which bisects his garden, Gary pulled back the branches revealing our path ahead and announced, ‘You are now entering the Reserve,’ as if were stepping into an uncharted jungle. Here we stood and peered into the newt pond, hoping to catch glimpse of a golden newt but had to make do with columns of bubbles arising enigmatically from the bed. 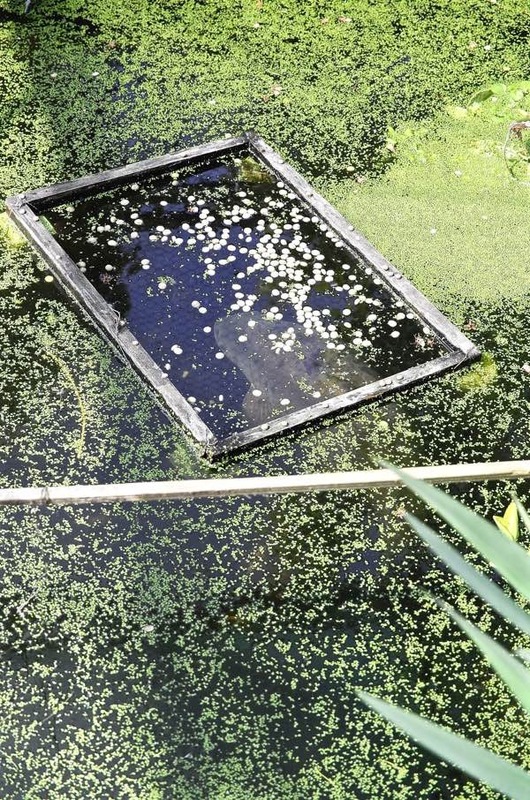 Most impressive was the carp pool beyond, inhabited by two vast pale creatures of more than twenty years of age and over two feet in length, accompanied by the fattest goldfish I ever saw. Gary stood in silent pleasure, mesmerised as they cruised ceaselessly around in the shadowy depths like ghosts. 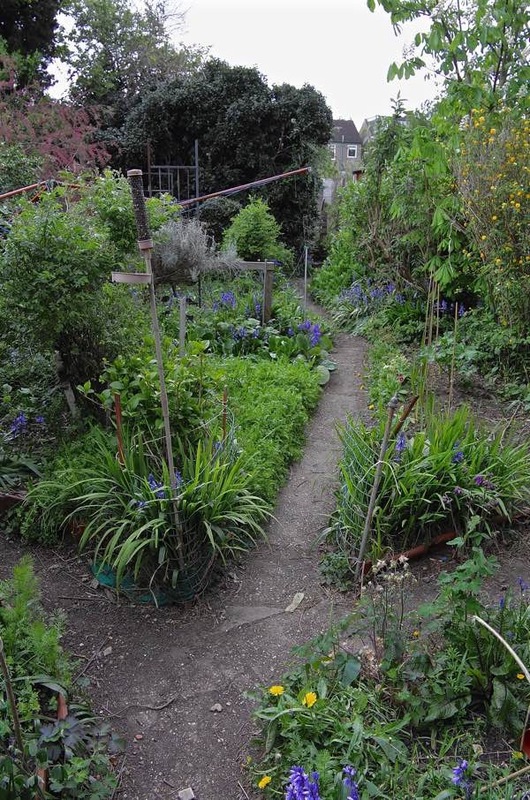 Several hours passed while Gary and I negotiated his garden of relatively modest size, and he recounted his stories. 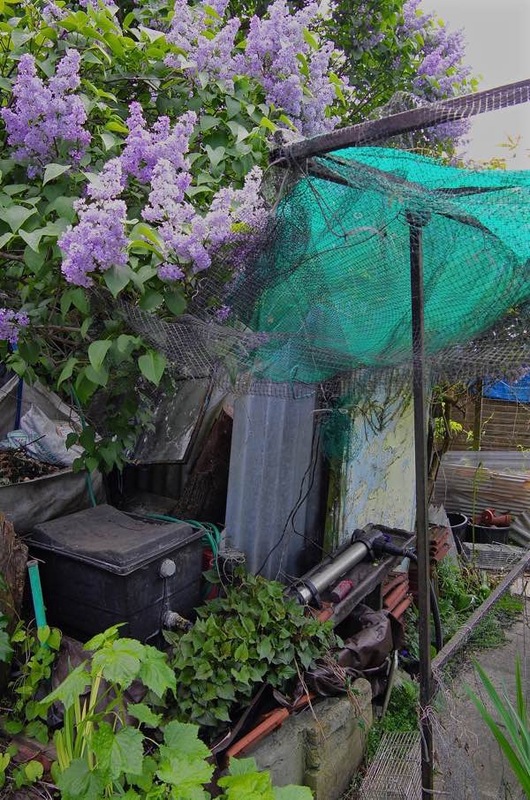 Then, once Gary had potted a teazle to accompany the yellow flag iris that he gave me years ago which now occupies a boggy corner of my garden in Spitalfields, we repaired to his house for tea. Since Ruby was taking her afternoon nap in the parlour, we tiptoed through the tidy house with our cups of tea and ascended a creaky metal ladder to Gary’s untidy attic, where he prefers to spend his time while indoors. Sometime in Gary’s youth, he must have discovered this loft and, out of respect for Ruby’s house-proud nature, today he restricts his stash of clutter and curiosities to this secret den. For my delight, Gary produced his father’s Air Raid Warden helmet, optical novelties for Magic Lanterns, finely-engraved wooden printing blocks and more. It was humid in the attic and I must confess I discovered myself dozing off while Gary regaled me with stories. This is a shameful admission but I include it here as evidence we need harbour no anxiety that Gary is living in a bereft state since his departure from the East End. Obviously, the closure of his grandparents’ printshop in the Roman Rd was an enormous responsibility for Gary which took its toll, physically and emotionally. Yet today Gary Arber is in fine fettle at eighty-six, he has put it all behind him and he is at home in Romford. 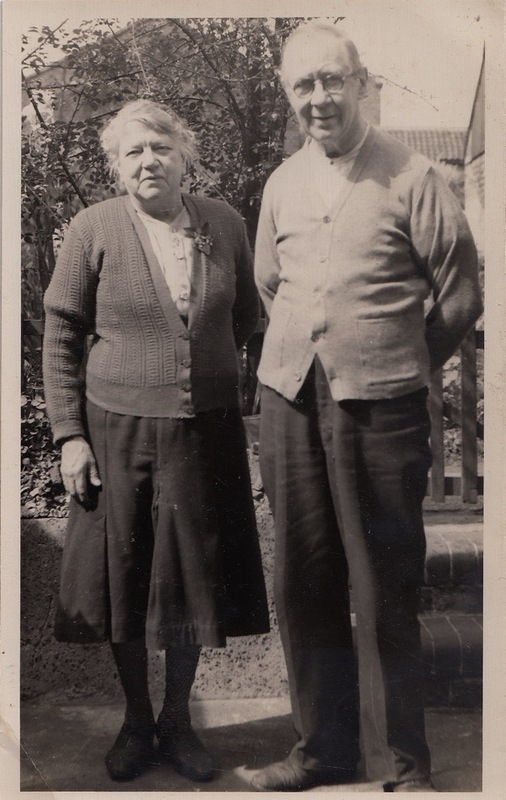 Dear GA….. lovely gentle blog today of living out your old age in peace and harmony. Fabulous! Hi Gentle Author I just love your accounts of London life. Standing firm, down to earth (yes, and a little eccentric) in this world of change. A way of ‘being’ which I can clearly detect amongst my own, never unique, but to be remembered through your characterful accounts of larger than life, real peoples. Thank you, another great account, full of heart. What a lovely garden and I love the holiday picture. So smart. Great to see Gary in such fine fettle! How lovely to hear about Gary! I worried he wouldn’t thrive without his shop but glad to hear he and Ruby are alive and well, and that he has plenty to be going on with. Of course he does.